The Routing Information Protocol (RIP) service enables network-wide convergence of routing information amongst gateways and routers. A RIP-enabled gateway passes its entire routing table to its nearest neighbor, typically every 30 seconds.  Export direct routes to the system’s internal interfaces. 1. Go to Network > Routing > RIP. • Enabled — Select to enable the RIP service. • Scan interval — From the drop-down menu, select the time delay between routing table imports and exports. For networks with fewer hosts, select a frequent scan interval. Networks with a greater number of hosts should use a less frequent interval. Note: There is a performance trade-off between the number of RIP-enabled devices, network hosts and the scan frequency of the RIP service. The periodic exchange of routing information between RIP-enabled devices increases the ambient level of traffic on the host network. Accordingly, administrators responsible for larger networks should consider increasing the RIP scan interval or the suitability of the RIP service for propagating routing information. The RIP service will add and update its routing table from information received from other RIP enabled gateways. The RIP service will also broadcast its routing tables for use by other RIP enabled gateways. The RIP service will add and update its routing table from information received from other RIP enabled gateways. The RIP service will only broadcast its routing tables for use by other RIP enabled gateways. • Logging level — From the drop-down list, select the level of logging. 3. 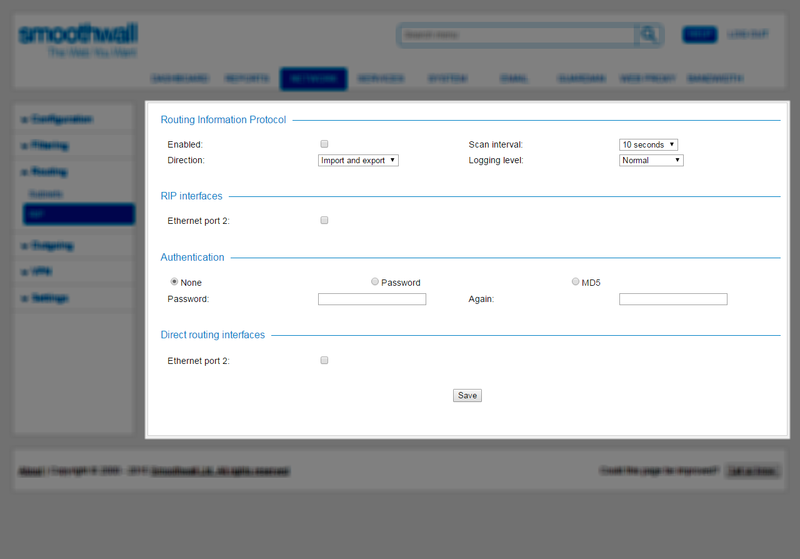 From the RIP interfaces panel, select each interface that the RIP service imports or exports routing information. 4. From the Authentication panel, choose the authentication method. • None — In this mode, routing information can be imported and exported between any RIP device. We do not recommend this option from a security point of view. • Password — In this mode, a plain text password is specified which must match other RIP devices. Enter the password in the Password box, and repeat it in the Again box. Do not copy and paste the password. • MD5 — In this mode, an MD5 hashed password is specified which must match other RIP devices. 5. From the Direct routing interfaces panel, optionally select those interfaces whose information should also include routes to the RIP service’s own interfaces when exporting RIP data. This ensures that other RIP devices are able to route directly and efficiently to each exported interface.